American managers quickly recognized the potential of The Mikado, and Sydney Rosenfeld was first to produce it (in Chicago). Meanwhile, Carte wasted little time, and for his New York production of The Mikado, he negotiated with two managers, John Stetson of the Fifth Avenue Theatre and James Duff of the Standard Theatre. When Carte signed a deal with Stetson, Duff prepared to stage his own production before Carte’s. Carte secretly took steps to thwart Duff’s plan, and was able to open his New York production at the Fifth Avenue Theatre in advance of Duff’s. 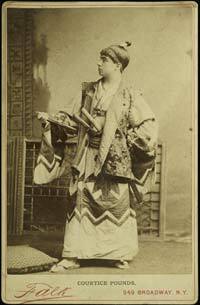 Carte’s production had an excellent English cast, and the success of the piece spawned an unusually large number of touring companies that spread The Mikado all over America. Carte organized several touring companies himself. 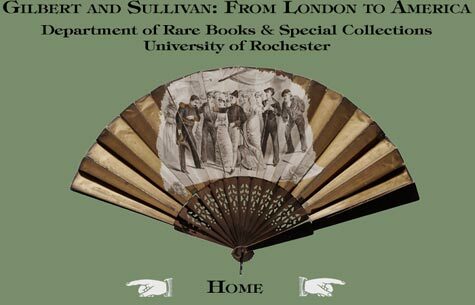 Evidence of the opera’s tremendous popularity include theatrical burlesques and political parodies, and the ubiquity of Mikado-related advertising and consumer merchandising. 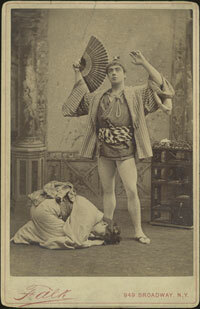 The Mikado continued as a theatrical staple well into the next decade. [Cabinet photograph]. New York: Falk . Courtice Pounds as Nanki-Poo and Geraldine Ulmar as Yum-Yum in D’Oyly Carte’s New York production of The Mikado at the Fifth Avenue Theatre. [Cabinet photograph]. New York: Falk . Courtice Pounds as Nanki-Poo in his second act costume. [Souvenir sachet satin book mark]. 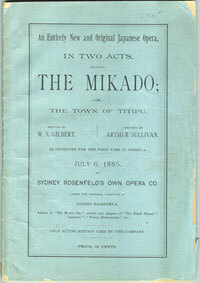 A souvenir of John Stetson's spectacular production of The Mikado at the Metropolitan Opera House, New York in April 1886. Central padded multicolored panel with engraving of the "Three Little Maids From School." The souvenir was presented to ladies purchasing the most expensive seats. W. S. Gilbert. The Mikado. [Chicago]: N.p., 1885. The earliest American libretto, printed for Sydney Rosenfeld’s production. [Condom packet]. The Mikado. N.p., n.d.
[Political parody]. The Albany 1686-1886. Bicentennial number, July 22, 1886. 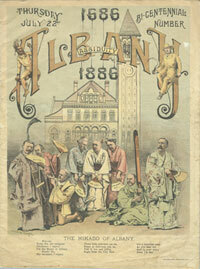 "The Mikado of Albany." [Cast metal sculpture]. N.p. : n.d. (ca. 1885). The title on the base reads "Three Little Maids From School." [Program]. New York: Standard Theatre, week ending Oct. 31 . The Mikado. J.C. Duff’s production that competed with D’Oyly Carte’s original New York Mikado. [Cabinet photograph]. New York: Sarony . W.H. 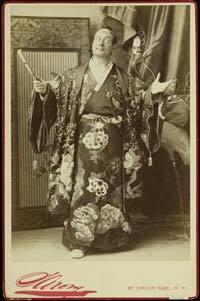 Hamilton as the Mikado in Duff's Standard Theatre production of The Mikado. [Program]. Lawrence, [Mass. ]: Opera House, Nov. 30, . The Mikado. D’Oyly Carte’s [Third Mikado Touring] Company, under the management of John Stetson. [Playset for The Mikado]. 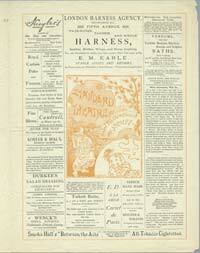 Boston: Supplement to The Sunday Herald, Mar. 1, 1896. A juvenile theatre playset with scenery, principal characters and chorus printed in colors on one sheet of heavy stock.